Tomorrow is Christmas. I haven’t hit the seven days promised so the plan will go the way of the New Year’s card. You know when those cards aren’t ready for the birth of Jesus so we say screw it, Happy New Year. Given the current state of fashion, there is something we need discuss before singing Happy Birthday tomorrow, ensuring no doll makes same error, given all the excitement. Did you see Michelle Obama’s final book tour stop? Because it’s off the runway for spring 2019? Because it’s cut to someone three sizes bigger than Michelle, making her appear enormous next to the diminutive Sarah Jessica, who also calls atrocious clothing fashion? Or was it that event planners had to place sunglasses on each seat prompting audience members not to look directly into the sun? 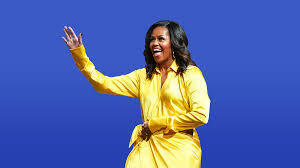 Our darling Michelle was a fashion stunner as First Lady, top mom and dictator of common sense. Who didn’t love her mix of high-low and admission that she’d actually seen the inside of TJ Maxx and loved J Crew? And that sometimes she just had to sneak out for a hamburger? It made her likable, relatable, and every once in a while, one of the girls. Of course, Michelle is free to wear whatever the hell she wants–so is Carrie. And me. And you. But whomever is helping her now–can you buy the right size? The yellow–tough for any complexion–is way too big and she held it shut the whole time. Or was she holding it up or closed? Whatever, she was gripping that middle, tie section for life. The boots work if you’re job is on a stage in Vegas, or some sort of street work. Despite the hefty price tag, the boots are not worthy of a former first lady. Or anyone with taste. She may be able to be, and wear, whatever she wants now but she will always be watched and examined. Wouldn’t a girl want to be known for her signature pearls, impeccable hat choice, Dior suits or love of J Crew more than crotch grazing glitter bomb boots–a top choice of any five-year-old in the middle of Walmart?